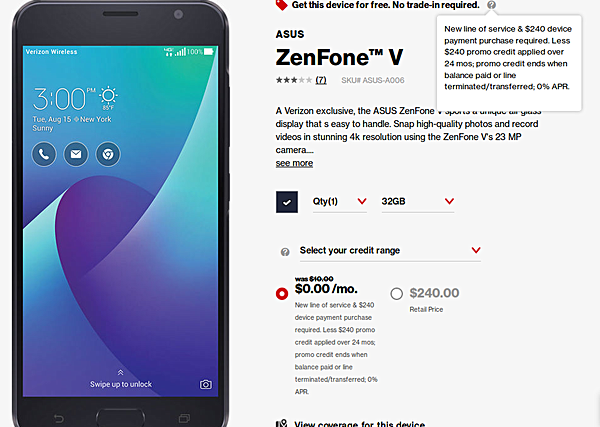 Asus Zenfone V was went official as a Verizon-exclusive in the US in September. The phone carried a launch price tag of $240, while the carrier has also been offering it on monthly plans for $10/month. Now, as a part of the carrier's Black Friday promotions the device is offered for free when purchased on a contract. You need to active a new line of service and shell out $240 initially. You'll however get promo credits worth that amount applied over the period of 24 months. It's a limited time deal that ends today. For more info, head to the Source link below. The phone is a complete and total pile of excrement that isn't even worth "free" from Verizon. You get what you pay for with Verizon....spend the extra money and get a true flagship device. the article says t he 240$ will be deducted later from your monthly bill i think, so it's basically free! So it's free once you pay $240. The definition of free sure has changed.